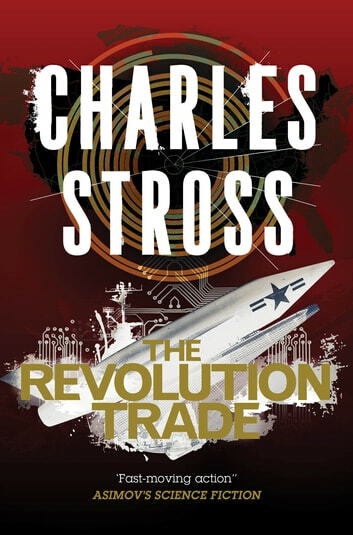 **The Revolution Trade: an omnibus edition of the fifth and sixth novels--The Revolution Business and Trade of Queens--in Charles Stross's Merchant Princes series. Miriam Beckstein has said good-bye to her comfort zone. The transition from journalist to captive in an alternative timeline was challenging to say the least, she discovered that her long-lost family, the Clan, were world-skipping assassins. Now, while civil war rages in her adopted home, she's pregnant with the heir to their throne and a splinter group want her on their side of a desperate power struggle. But as a leader or figurehead? Meanwhile, unknown to the Clan, the US government is on to them and preparing to exploit this knowledge. But it hadn't foreseen a dissident Clan faction carrying nuclear devices between worlds—with the US president in their sights. The War on Terror is about to go transdimensional. But Mike Fleming, CIA agent, knows the most terrifying secret of all: His government's true intentions. A good ending. Buts ends not completely tied. I enjoyed the merchant family story line very much. I do hope that Mr. Stross gives us further works fine om this continuum.